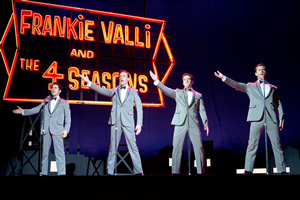 Jersey Boys is a medley of rock ‘n’ roll cliches. It’s hard to be mean to a movie like Jersey Boys. Well, it’s sorta hard. It’s well-directed by Clint Eastwood and the cast, largely comprised of fresh faces, is fairly terrific. It even stars John Lloyd Young, who won a Tony for his performance as Frankie Valli on Broadway. But — and it’s a really big but — it’s nearly impossible to give a flip about the hairdresser-hustlers behind Frankie Valli and The Four Seasons. It’s not really a musical per se. It’s a drama with a few songs. There’s no bursting into song at random, in public places, either. All of the hits are performed in the context of a recording studio or in a club or in larger performing arts venues. There is that salute to cheese at the very end, though, a curtain call of sorts that brings back the entire cast and parades them down the street to the infectious beat of Frankie’s music. The cynical view would say that’s a cheap ploy - and one often put to use in similar jukebox musicals on Broadway - sending people out of the theatre on a high note. All of the standards are there. Not the musical numbers, the dramatic beats. There’s the perpetual in-fighting, the guys who lack character despite that thick-as-thieves Jersey code of honor among family and its tawdry extensions, family clashes, broken furniture, shattered glass, infidelity, bad finances, yadda, yadda, yadda. Does it matter that Frankie Valli, now 80, and Bob Gaudio, now 71, served as executive producers on this filmed version of the stage show? Well, it does give a certain sense that this is an honest-to-gosh warts-and-all true story about some thugs who rob a jewelry store one minute then perform in a pop band the next, with Frankie sporting his velvet voice on stage and wooing the ladies. If this is truth, then so be it. But the drama revolves around some arguably stupid people demonstrating poor character. Hit after hit after hit drops into Frankie’s lap by way of Gaudio (Erich Bergen, reprising his role from the touring production) and Bob Crewe (Mike Doyle, Rabbit Hole); the creative struggle is limited to a brief bit of drama around getting some studio time. Is Frankie worth cheering for? That depends on how much you like his music. However, when the drama degrades to matters of Tommy DeVito (TV’s Boardwalk Empire) bilking the band of hundreds of thousands of dollars, it’s more of a yawn than anything else. After all, Billy Joel lost millions thanks to unscrupulous accountants (and bad women). That kind of financial dirty dealings behind artists’ backs is practically par for the course. Frankie takes on the debt and grabs every gig he can get in order to pay back every penny — while Tommy is banished to Vegas. Sure. It’s a good story. But it’s not well told. Eastwood and cinematographer Tom Stern do a stellar job of visually recreating the time period, which covers 1951-1990. They’ve worked together through the decades on movies including Letters from Iwo Jima, Invictus, J. Edgar and Changeling; they even collaborated on 1988’s Bird, about jazz artist Charlie Parker. The problem is there’s no real hook to transition from the Broadway stage to the silver screen. Chicago went creative with its conceit behind the musical numbers; Les Miserables opened the scope and went for big-screen spectacle. Here, several characters talk directly to the camera (the film version of a stage actor talking directly to the audience), throwing in their two cents about the situation. After a while, the technique becomes uncommonly annoying and distracting. There’s simply too much noise that gets in the way of the feel-good music, which includes Sunday Kind of Love (the Etta James classic performed in a church is a movie highlight), Can’t Take My Eyes off of You, Walk Like a Man, Big Girls Don’t Cry and Sherry.